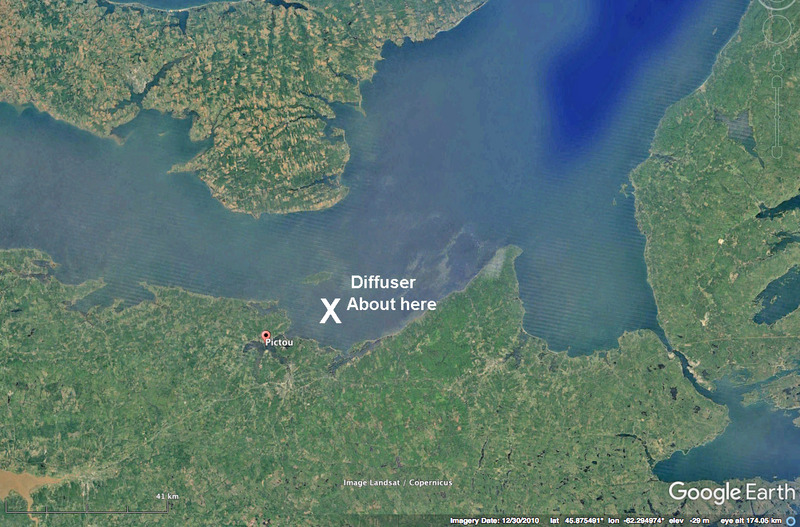 The effluent from the proposed new pulp effluent treatment plant would be released in the Northumberland Strait at approximately location X on the Google map above. Fishers are concerned about impacts on lobster, crab, scallop, herring, and mackerel fisheries. “Northern Pulp and Dillon Consulting Limited held an open house at the Pictou County Wellness Centre Monday [Dec 3] outlining future plans for a replacement effluent-treatment facility” according to a report in The News by Sam MacDonald, Dec 4, 2017: Mill outlines proposed effluent treatment. This meeting was apparently in addition to the meetings cited as the first open house in progress today (Dec 5) and tomorrow, at New Glascow and Pictou as listed on the website for the treatment facility EA. Terri Fraser, the technical manager and project lead for the replacement facility was the lead for the Monday meeting. He said that “the treatment facility would be built beside the mill, with a pipeline to carry treated effluent to an outfall site in the Northumberland Strait” and provided various technical details. View The News. Also in The News: Truro author disappointed that New Glasgow book signing cancelled by Sam MacDonald Dec. 4, 2017. The author [Joan Baxter] of “The Mill: Fifty Years of Pulp and Protest” wasn’t happy when she found out Coles at the Highland Square Mall [in New Glascow] cancelled a public signing of her book. Apparently the cancellation was due to concern that there could be some public unrest or or that there were threats or something of that nature; details are not specified and the reporter was not able to reach staff at Coles to find out exactly why it was cancelled. The controversy that arose at the New Glasgow Coles was a far cry from the comparatively quieter scene that took place at the book signing in Baxter’s own hometown, in Truro, where she signed copies of her book on Saturday. Sam MacDonald for The News Nov. 30, 2017. The article cites Kathy Cloutier, director of communications for Northern Pulp “Cloutier noted the proposed design for the replacement treatment facility is entering a public consultation stage, and in those sessions and engagements, the company will present the design and “obtain specific concerns and questions regarding the project.” No mention that the first Open House session would be held the following week. Dirty Dealing: Northern Pulp Mill and the province are set to roll the dice with Boat Harbour’s replacement, but a cleaner alternative exists by Linda Pannozzo in the Halifax Examiner, Nov 22, 2017. Comprehensive examination of the options for managing the effluent from the Northern Pulp mill.